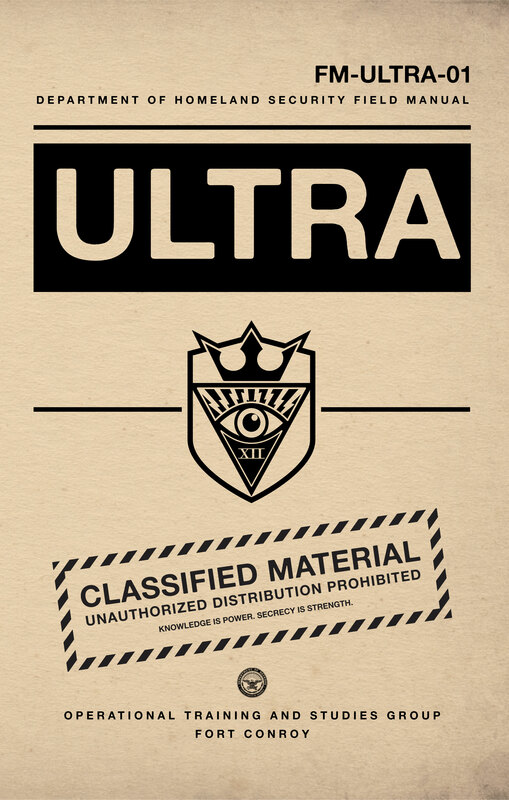 Originally produced as a Kickstarter "extra," FM-ULTRA-01 is a manual for use by ULTRA, a top secret covert paramilitary organization, bent on seizing exotic technology. Field manual (ULTRA) 1-0 is the second revision of this publication. All copies of the prior edition (M12 0-1) must be destroyed according to UXB-O procedures. The remains must be obliterated by UXB-P procedures. Failure to comply with either UXB-O or UXB-P procedures is punishable by CLASSIFIED ULTRABLACK. ULTRA1-0 makes numerous changes from the earlier edition. 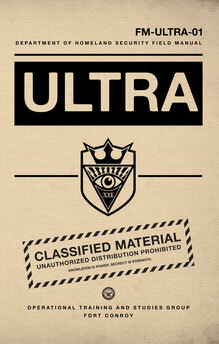 The most significant is the elimination of all the appendices which have been been classified BLACKULTRA and are now beyond the security clearance of all TASK FORCE ULTRA printers. An oral recitation of any individual appendix may be requisitioned. Do not requisition oral recitation without the proper security clearance. Do not requisition from an individual who lacks the proper security clearance. Appendix related offences are punishable by CLASSIFIED ULTRABLACK. This manual provides basic doctrinal discussion on the organization and operations of TFU and contains compartmentalized information essential to the security of physical constants, sustainability of life upon the Earth, and stability of the Solar System as well as Alternative Minkowski-Viable Spaces (AMVS) local to or intersecting with the Solar System.